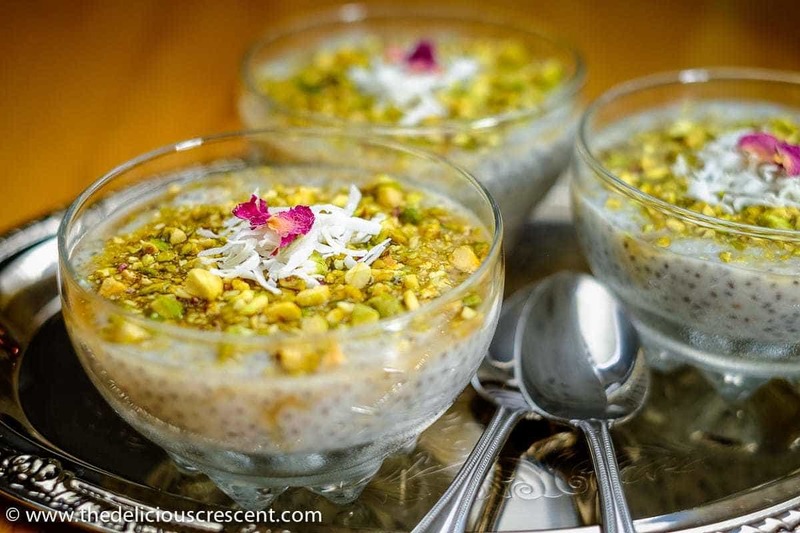 Chia Mahalabia with Pistachios – an inspired version of a popular dessert, packs a nutritional punch with omega-3 fats, fiber, protein and more!! I have fallen in love with these tiny little chia seeds – they delight both the nutritionist and the cook in me. My favorite way to consume these so far, is as a pudding. Mahalabia is a hugely popular middle eastern pudding. Loved by grown ups, kids, the natives and those who are new to it. I decided to use these chia seeds to create a more nutritious version of Mahalabia and the bonus is that it results in a pretty interesting texture and mouthfeel too. Chia seeds are super nutritious. They are an excellent source of omega-3 fatty acids, fiber, antioxidants, phosphorus, manganese and calcium. These seeds also provide a good amount of protein – one ounce contains 5 g protein. The high fiber content in chia seeds is an especially important point to consider. As fiber rich diets are beneficial for intestinal health, weight loss, lower blood pressure and cholesterol levels. The omega-3 fatty acids from the chia seeds can also help with good cardiovascular health, lower cholesterol and triglyceride levels. Chia seeds are versatile and can be used in many different ways. They are popularly used in puddings and smoothies. But they can be eaten with cereal, used in baking, making meatballs/croquettes etc. I have also used brown rice flour for this recipe. Brown rice, as you would think, is nutritionally superior to white rice – as it has more fiber, vitamins, minerals and antioxidants, which are all lost during the processing of white rice. Here is another recipe using brown rice – Persian Shrimp Quinoa Herb Rice. I was amazed that there was hardly any difference in taste when using the brown rice flour as compared to white rice flour. Except that the color was a bit off white. 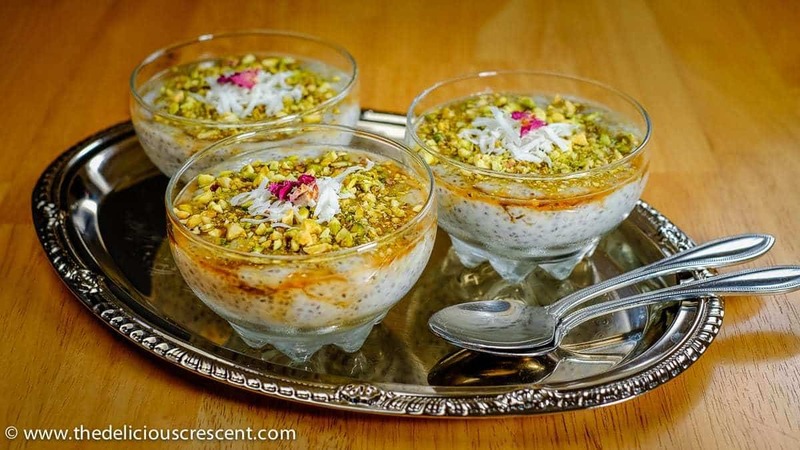 Nourish yourself while pleasing your senses devouring this Chia Mahalabia with Pistachios!! 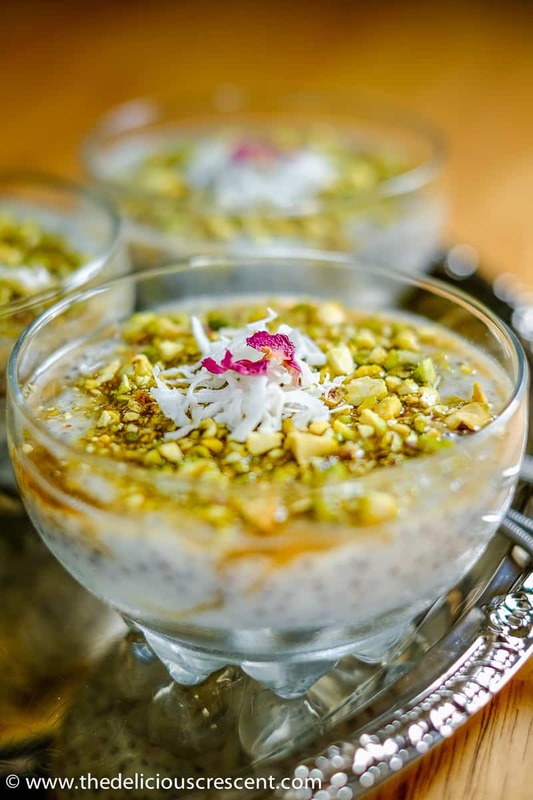 Chia Mahalabia with Pistachios - an inspired version of a popular dessert, packs a nutritional punch with omega-3 fats, fiber, protein and more!! Blend milk and walnuts at high speed to form a creamy milk (optional). Mix 1 cup of milk, chia seeds, one tablespoon honey and 1 teaspoon rose water and let it soak overnight in the refrigerator. It helps to stir it a few times in the first five minutes when the seeds start to absorb the milk. Heat one cup of milk in a sauce pan at medium high heat. Mix 1/2 cup of milk with the rice flour. Stir 2 tablespoons of honey into the hot milk. When the milk comes to a boil, take it away from the heat source and mix in the rice flour milk paste. Place the saucepan back on the stove and slowly stir and cook it until a thick custard stage. Mix the orange blossom water and remaining rose water. Line a lid with a paper towel and place it over the saucepan and let it chill very well. The paper towel will help absorb moisture. 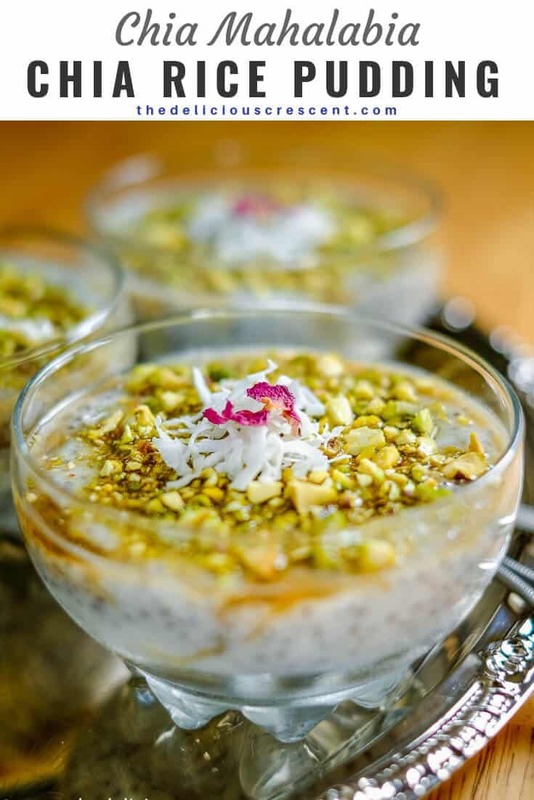 Mix the chilled chia pudding with the brown rice pudding and spoon it into serving bowls. If using cardamom, mix it with nuts. Decorate the pudding with nuts and coconut flakes. Serve this Chia Mahalabia with Pistachios immediately. Enjoy! I used Bob's Red Mill brown rice flour. Definitely will try it out! Thank you for this healthy recipe. 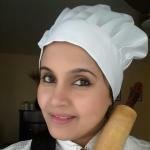 May i ask if i can use cornstarch instead of brown rice flour? Thank you so much Nora. Sorry for the delay in my response. Was away from my blog work. Certainly you could use corn starch too. Although, if you use corn starch you may have to serve the prepared pudding immediately after combining with the chia seed pudding.